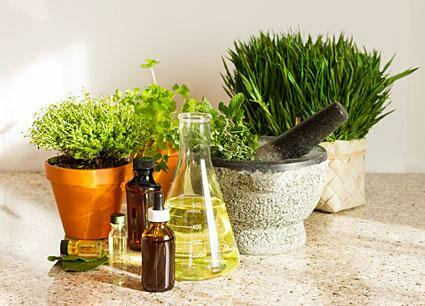 Ayurvedic medicine has been around for centuries and originated in India. It's based on the belief that the body, mind, and spirit must be in balance in order to prevent illness. This form of medicine uses herbs to help maintain good physical and emotional health. Any list of Ayurvedic herbs is substantial and must be broken down by doshas, the three distinct mind-body types in Ayurvedic medicine. You'll find many of the herbs are common ingredients you've likely used in the past. In Ayurvedic medicine, the three doshas are Vata, Pitta, and Kapha. It's believed that every person has at least one dominant dosha. Each dosha has distinct characteristics and uses different herbs to help balance body, mind, and spirit. To determine your dosha, take the quiz offered by the Chopra Center Marketplace. This herb, also known as Indian ginseng and winter cherry, is often prescribed in Ayurvedic medicine to increase energy levels and decrease stress and fatigue. According to Memorial Sloane-Kettering Cancer Center, Ashwagandha is iron rich and studies show the herb to have anti-tumor, antioxidant, anti-inflammatory, and anti-stress properties. In addition, the herb may help improve insulin sensitivity. Ashwagandha may cause abortion and should never be used by pregnant women. The Chopra Center states that Triphala is primarily used as a means to detoxify the body. However unlike traditional over-the-counter laxatives that often leave the body depleted after use, it's believed that the antioxidant properties of Triphala leave the body and immune system strong and balanced. A bitter tasting herb, Kantakari is often used in Ayurvedic medicine to treat lung issues such as asthma, bronchitis, and pneumonia. The herb is believed to be an expectorant and have powerful blood purifying and anti-inflammatory properties. It may also be helpful in treating fevers. Rasona, also known as garlic, is known for its pungent sulfur odor. It's believed garlic may help reduce cholesterol, reduce blood pressure and improve some digestion disturbances. It's anti-bacterial properties may help protect against bacterial infections and help heal some skin disorders. Garlic is known to thin the blood so you should not use the herb if you take blood thinners or plan to undergo surgery. Also known as fenugreek, Methika is believed to help stabilize blood sugar levels and ease some digestive disturbances. In fact, an abstract on the National Institute of Health's website found fenugreek to not only help balance blood sugar but to also potentially protect the heart from diabetes complications. Although fenugreek has been used for centuries as a way to help increase lactation, there are no studies to date proving this theory. Amalaki, also known as the Indian gooseberry, is actually a small tree that produces small antioxidant packed fruits. The Chopra Center says that Amalaki is considered a very powerful rejuvenating Ayurvedic herb. In fact, it's believed the fruits contain twenty times more vitamin C than orange juice. Amalaki is also believed to have antibacterial, anti-inflammatory, and liver-protecting benefits and is used in Ayurvedic medicine to treat the liver and bones and nourish the blood. Known in English as the common grape, Draksha uses the fruit, stem, sap, leaves, and flowers of the plant. The astringent leaves are used as a diuretic and to treat common skin disorders; the sap is also used to treat skin problems; the fruit is used as a laxative, an aphrodisiac, to promote intelligence, and relieve digestive issues, and the flowers are used to treat liver disorders, bronchitis, and some bleeding issues. This herb, also known as licorice, is used in Ayurvedic medicine to treat respiratory disorders and gastric ulcers. A study of oral cancer patients who developed oral mucositis from radiation and chemotherapy showed Yashtimadhu helps prevent and treat mucositis. Also known as sandalwood, Chandan is a fragrant ingredient made from the sacred Sandal tree. It's found in many aromatherapy blends but is also used in paste form to treat common skin disorders, and to cool, cleanse and hydrate the skin. According to The Chopra Center, Ayurvedic history suggests that bitter tasting Guduchi promotes overall well-being and helps the body resist the effects of anxiety and stress. It's used to help prevent colds and flu, support the immune system, relieve chronic skin disorders such as eczema, and helps protect the liver. According to the website of Todd Caldecott, an Ayurvedic practitioner, Ushira is a perennial grass whose essential oil is used to treat a wide variety of ailments. Some of these ailments include intestinal and stomach disorders, respiratory issues, inflammatory conditions, and skin problems. Ushira is a particularly fragrant herb and has a cooling effect on the body. Sunthi, or dry ginger, is a strong flavored ingredient known for its ability to ease digestive disturbances such as nausea, flatulence, and indigestion as well as ease symptoms of the common cold. Studies show ginger has anti-spasmodic abilities and may battle the growth of H. pylori, a bacteria responsible for many gastric ulcers and other gastric symptoms. This herb is commonly known as turmeric. It's closely related to ginger and has historically been used in Ayurvedic medicine to help digestion, ease arthritis pain, and help heal wounds. While studies on turmeric are ongoing, the National Center for Complementary and Alternative Medicine (NCCAM) states that a compound found in turmeric -- curcumin -- is believed to have anti-inflammatory, anticancer, and antioxidant properties. NCCAM indicates that turmeric is generally considered safe but may cause digestive or liver issues in high doses. In addition, people with gall bladder problems should avoid using the herb. Known as garden mint in English, Putiha is a very beneficial Ayurvedic herb. It's used to relieve the symptoms of digestive problems such as flatulence, nausea, vomiting, and appetite issues. NCCAM indicates that studies show mint does in fact help relieve the discomfort of irritable bowel syndrome and may relieve indigestion. According to the Tillotson Institute of Natural Health, Haritaki fruit strengthen immunity and has a laxative effect. It's also used to nourish major organs such as the heart, liver, and kidneys and to help heal eye disorders. The herb contains astringent properties as well as tannins which may help reduce the effects of stress on the body. Commonly known as celery seed, Ajmoda is a delicious herb with a distinct, pungent taste. According to the University of Maryland Medical Center, celery seed has traditionally been used in Ayurvedic medicine as a diuretic, to treat colds and flu, improve digestion, ease arthritis discomfort, and relieve liver and spleen disorders. Some animal studies show celery seed may reduce cholesterol and blood pressure but more study is needed to determine if this is true for humans. The herb may cause photo toxicity so care should be taken if you're using the herb and plan to spend time in the sunlight. In addition, pregnant women should avoid celery seed since it may cause uterine bleeding and/or contractions. Better known in English as cloves, the spicy Lavanga herb has a warming effect on the body. MedLine Plus states that cloves have been traditionally used as an expectorant, to treat common digestive troubles, and as a pain relieving ingredient. They also caution that cloves may affect blood clotting and should not be used with any medications or herbs that also slow blood clotting. Banyan Botanicals: This company has an impressive selection of Ayurvedic herbal remedies including teas, supplements, extracts, balms, and self help items. The Chopra Center Marketplace: Here you'll find a selection of Ayurvedic herbal supplements as well as a wide variety of items to help you balance body, mind, and spirit. Zandu: This company offers a huge variety of Ayurvedic herbal items including supplements, balms and teas. While Ayurvedic medicine is certainly not new, it's popularity in Western culture is enjoying increased growth and interest. Many people recognize the benefits of keeping the mind, body, and spirit in balance and wish to learn more about Ayurvedic herbs as an alternative to conventional medicine. However, it's important to stress that all herbs have the potential for serious side effects and any herbal remedy should be used with caution and only under the care of a medical practitioner, especially if you are pregnant or have an underlying medical condition.